Tomorrowworld, the 3-day music festival that calls Chattahoochee Hills home, is preparing to unlock the magic once again in 2015 for its third edition. Ticket sales have started for the event, which has its dates set as the 25th through 27th of September, 2015. Tomorrowworld is a massive production, requiring hundreds of people working tirelessly for months to put on a good show. Project Manager Jamie Reilly oversees the Tomorrowworld preparations. Having spent a dozen years at Cirque du Soleil, Reilly is no stranger to extravagant spectacles. Georgia Unfiltered recently caught up with Jamie Reilly to talk Tomorrowworld. 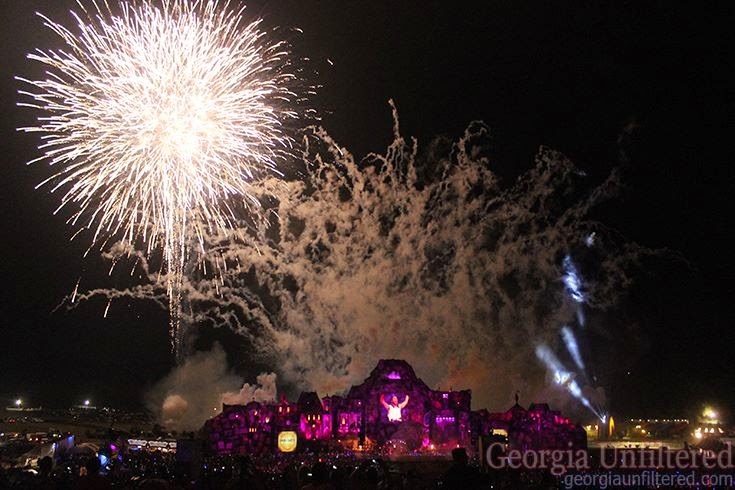 With two years of Tomorrowworld now under your belt, what lessons did you learn from the first year that you applied to the 2014 edition; and what lessons have your learned from 2014 that will help improve Tomorrowworld in 2015? Jamie Reilly: Each year we seek to improve ourselves and offer a unique and special experience to our fans. In 2014, we focused a lot more on highlighting the amazing features of the Atlanta & Georgia area. We partnered with more local vendors (from supplies to food offerings at the venue). We also had more local media partners allowing us to customize our approach locally. We plan on continuing our local involvement and ensuring that the local area is well represented during the festival. We are currently [working] on our strategic approach for 2015, and ensuring we continue to surpass our fans' expectations. Do you have an estimate of how many people attended Tomorrowworld in 2014; and how many people camped in Dreamville? Jamie Reilly: We are excited to report that TomorrowWorld greeted 160,000 fans and 40,000 campers at the magical grounds of DreamVille. Fans of the Tomorrowland festival in Belgium have noticed that Tomorrowworld gets the same mainstage that Tomorrowland had the year before. Are there any plans to develop a unique mainstage for Tomorrowworld that would differentiate the event from its sister festival in Belgium? Jamie Reilly: There are many differences and nuances between both Festivals, and we try to come up with different creative initiatives for both. TomorrowWorld is set on a very unique venue that is incomparable to anywhere else. It allows for a different experience. But we do share the same theme as Tomorrowland. As we are part of the same brand and family, we want to be able to transport that same culture to the US. Will there be another economic impact study done? If so, when can we expect those numbers to be released? Jamie Reilly: We are currently working on this. I do not expect to see the results before the New Year. Ticket sales for Tomorrowworld 2015 started less than two months after the close of the 2014 event. Why the early start for next year's event? Jamie Reilly: We decided to go on sale earlier this year, following the excitement and the success of Tomorrowworld 2014! We were too excited, as were our fans, and we didn’t want to wait! We also wanted to allow for our fans to better plan ahead, put the dates in their calendars, and benefit from our payment plans should they decide to do so. Also, as Dreamville was sold out in 2014, we wanted to allow our fans to be able to book their travels and secure their camping spot earlier than last year. Let's talk artists...Can you give us any hints or sneak previews of what artists might be coming to Tomorrowworld next September? Jamie Reilly: Unfortunately not at this point. It is too early to make any announcement, but once again we will seek to get an amazing and diversified line up. Finally, the Douglas County community again complained about noise during this year's event. This seems to be an ongoing problem. What's being done to solve it? Jamie Reilly: This is something we have taken seriously and will continue to do so. We have a dedicated local agent. We organize a phone line, and each complaint is addressed during the festival. I am happy to say they are at a minimal. We will take the results of this year to continue to adjust and improve to mitigate as much as possible the impact on the community. We pride ourselves on our community relations and being a good neighbor.